Have you ever wondered what to do with those unwanted left-over paint tins in the garage? 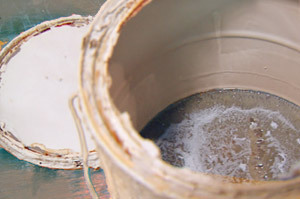 Paint can be disposed of in the usual weekly garbage collection once it has been dried out, by pouring it into kitty litter or onto old newspapers. Although that can be quite a hassle – as getting rid of your wet paint can suddenly become quite tricky if you have a fair amount of it. Why is paint tin disposal an issue, can’t it just go in the bin? Paint contains chemicals that can poison our water and endanger human health; pouring it down the sink or into drains causes much harm to our environment and is a serious health risks to humans and animals. This is also an issue with mostly full cans of paint in landfill as the contents will eventually leech into the water table and contaminate it. This is the same reason that sump oil containers cannot be put in the bin. So do you need to load your old paint cans and oil containers into your freshly cleaned car and head to the nearest place of disposal (which could be an hours drive away)? Thankfully the answer is no – at 1300Rubbish we can take your paint tins for you, at a small charge per litre, assuring of the safest possible disposal and at your convenience.